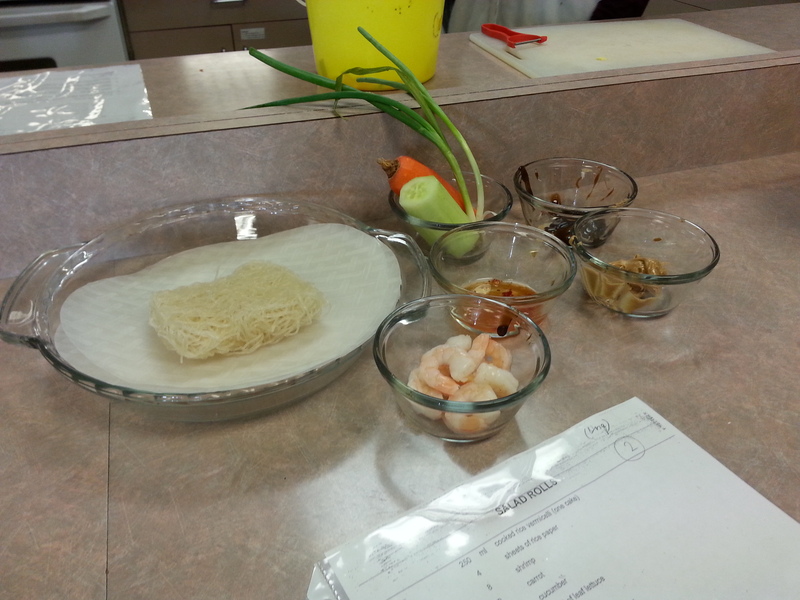 1.I enjoyed this lab since we got to make salad rolls and salad rolls are one of my favorite food. 2.I would add a bit of fish well just like a thin wall of fish around the rice noodles(it would add vitamin b-12, magnesuim, vitamin b-6, vitamin c, iron, vitamin a) 3.The process of deep frying food is generally detrimental to its nutritional value. The oils that foods absorb in their batter typically contain large amounts of fats, especially saturated fats and trans fats. Consumption of large amounts of saturated and trans fats has been linked to a higher risk for some cancersincluding prostate cancer. Eating deep-fried foods has also been linked to higher cholesterol levels, obesity, heart attacks, and diabetes. Deep-fried foods cooked at certain temperatures can also contain acrylamide, a possible carcinogen.Additionally, fat degradation processes during deep frying results in the loss of nutritional value in deep-fried foods. Reused deep fried cooking oil may in addition cause blood pressure elevation and vascular hypertrophy.